The garden is all in. Changed things up in the garden again this year, and we are trying something different. Yes, I do like to try different things. My mom used to laugh at me because I was never content to do the same thing year after year. I have been following Old World Garden Farms blog recently and they have inspired me. Our rows this year are slightly raised. 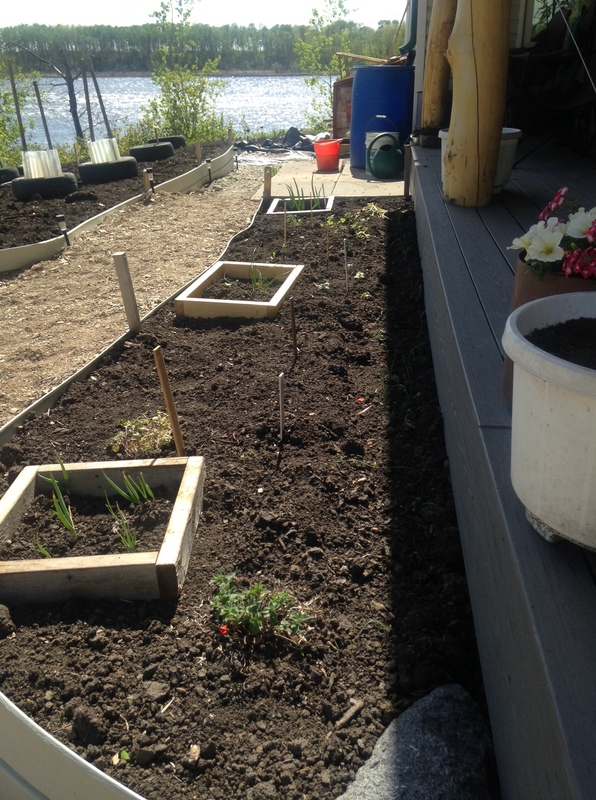 I dug out the paths between the rows, placing the soil onto the row, raising it slightly. The paths were then heavily mulched with old flax bales from our previous flax bale garage. Each row is about 5 feet wide, wide enough for our rototiller to work up. This is a bit wider than I would like, but that is the size of our rototiller. 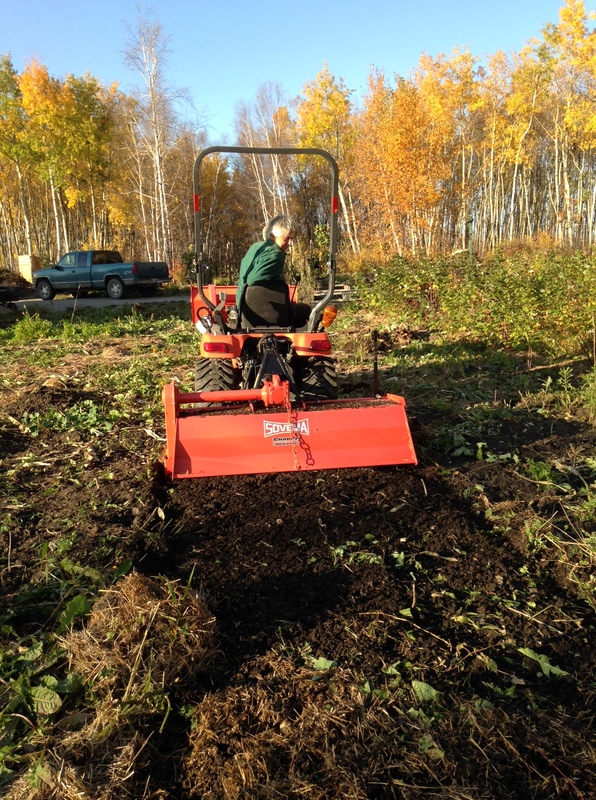 The idea is that each year we will rototill the rows in the fall and spring, leaving the mulched paths intact. After the work in digging out the paths and mulching them, I am hoping this will make the spring prep on the garden easier. Just rototill the row and top up the mulch on the paths. Right now the rows are bare earth. 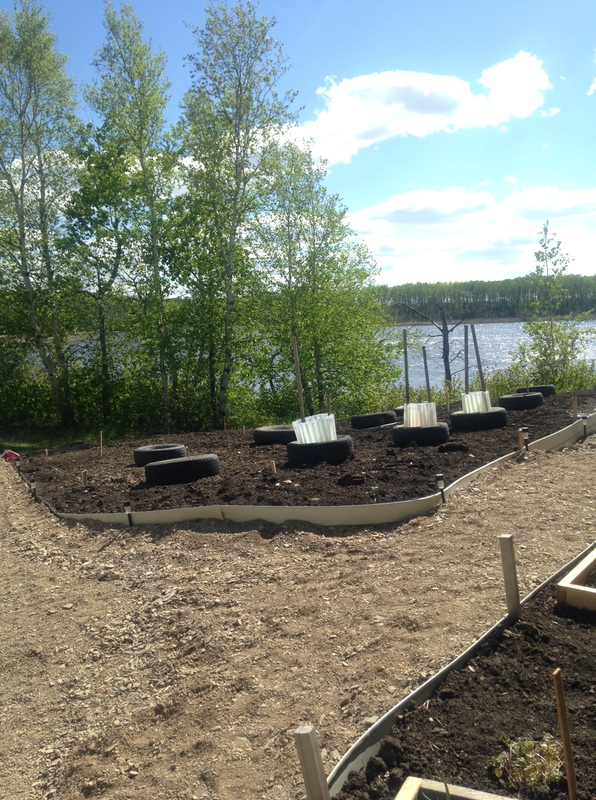 I will wait until the plants are up and established, then I will mulch the rows as well. 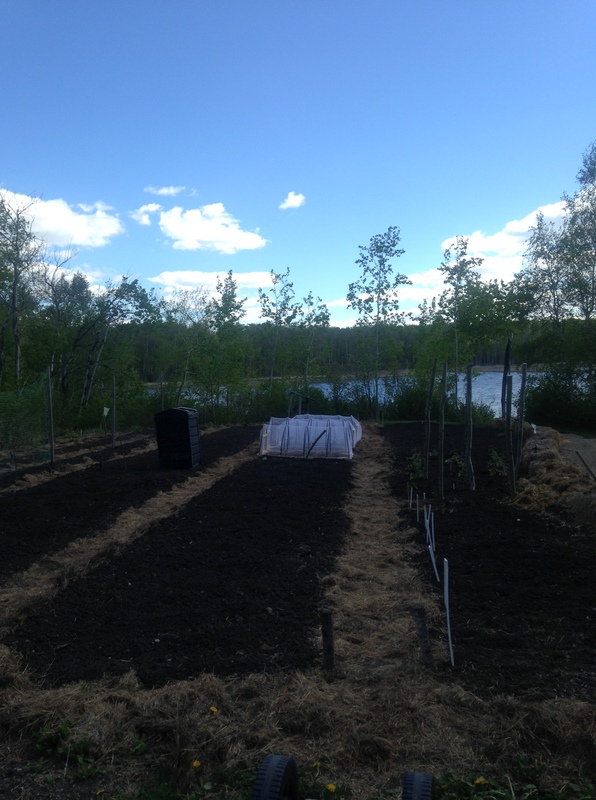 The mulch in the rows will be tilled under in the fall, along with the garden refuse, to feed the soil. Also following Old World Garden Farms recommendations, I have done some companion planting. I have planted corn and beans together. The corn is a heavy nitrogen user and beans are a nitrogen fixer. The Iroquois used to plant corn, beans and squash together (called the three sisters), letting the beans climb up the corn and the squash run all around. I have tried that before without much success. Maybe the Iroquois harvested the beans dried at the end of the season with the mature corn and squash. That would make sense. But it doesn’t work as well when you are picking the beans young and green first, then the corn young and sweet and then the squash in the fall. However, I am trying planting bush beans at the perimeter of the corn. That way I can pull out the beans once they are finished and be able to get in and harvest the corn without them being in the way. I am also trying some natural methods to control my biggest pest, the cabbage butterfly. I stopped growing brassicas – cabbage, cauliflower and broccoli, because they become loaded with little green worms, the larvae from the butterfly. And they are voracious, and can eat a cabbage head to nothing. I refused to use insecticide. One lady in town told me the secret was to plant early, harvesting early before the larvae come out. I tried that last year and I did manage to get a few small heads of cabbage and cauliflower and some broccoli but it seemed such a shame to pull out the plants just as they were starting to produce. This year, I have followed some of their recommendations for repelling pests. I planted thyme and dill around the brassicas, which are supposed to repel the cabbage butterfly. I have also planted marigolds and nasturtiums, which are supposed to attract a beneficial insect that controls the cabbage butterfly. 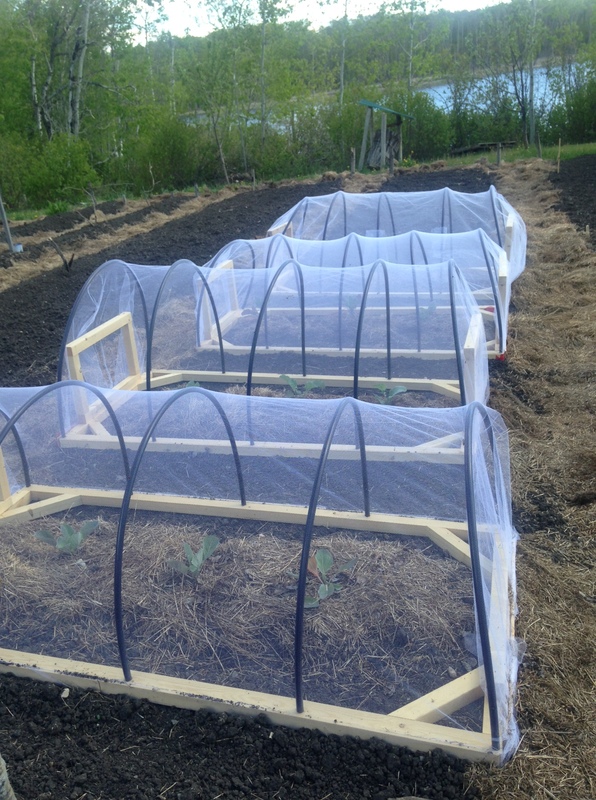 In addition to these companion plants, Ken constructed ‘Brassica Cages”- nifty covers for the plants. Each cage is big enough for 3 plants and light enough that I can lift it to weed or harvest. Ken made each frame out of 2×2 lumber with hoops made out of plastic tubing we had left from an underground sprinkler system we had at a previous residence. The frames are covered in netting. We were going to use black screening, the kind you use to repair screen doors but its kind of hard to work with for this application and we did not have enough to do all the cages. And I found I had a whole bunch of white toule – you know the stuff you make bridal veils from. I had tons of it left over from some craft project years ago. We will see how it holds up but it seems to be doing the trick so far. Its really easy to water through and the plants get lots of light. On my last trip to the city I did pick up 50 feet of shade cloth, which is what is usually used. If the netting doesn’t hold up, we can drape the cages in the landscape cloth. Three plants are in each cage. After planting I mulched them well to conserve water and reduce weeds. I also planted some kale seeds under the cages along with the cabbage, cauliflower and broccoli transplants. I am hoping that once I do harvest the plants, the kale and continue to grow until frost, protected from the cabbage butterfly. Another idea from the Old World Gardens I used was their tomato cages. They are a combination of a tomato stake and a cage. 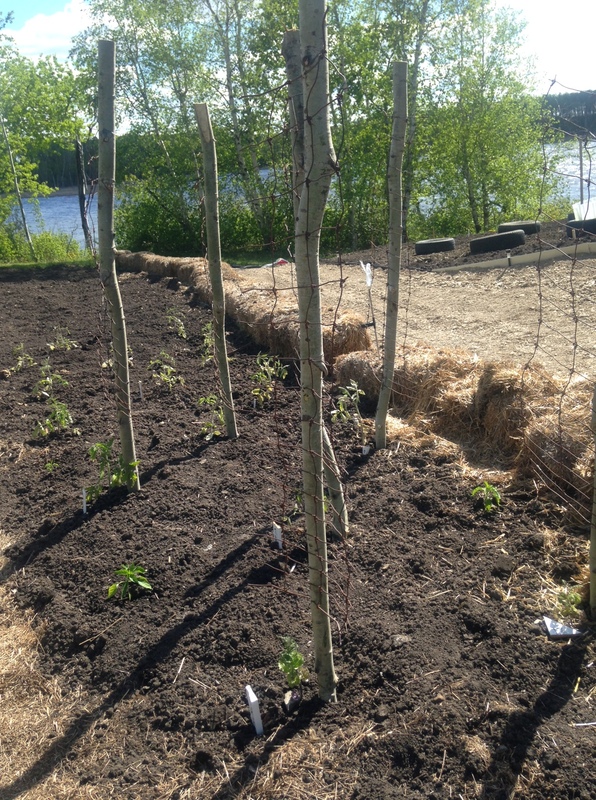 Ken constructed one for each of the 16 tomato plants using 3 inch diameter saplings and fencing wire. We made ours a bit higher than called for as I usually let my tomatoes grow to over 5 feet tall. 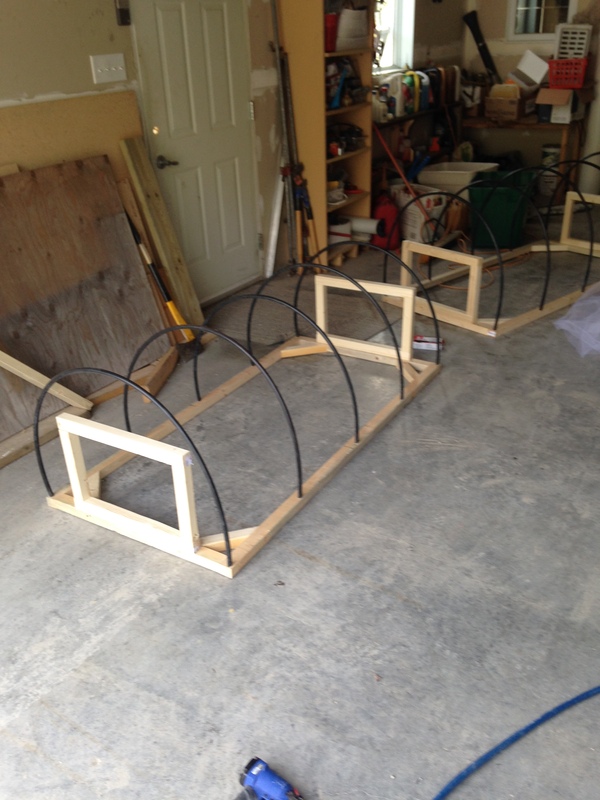 They are pretty sturdy and I am sure will provide great support for the plants once they are loaded with fruit. The stakes I used previously often toppled over under the weight of the plant and fruit. 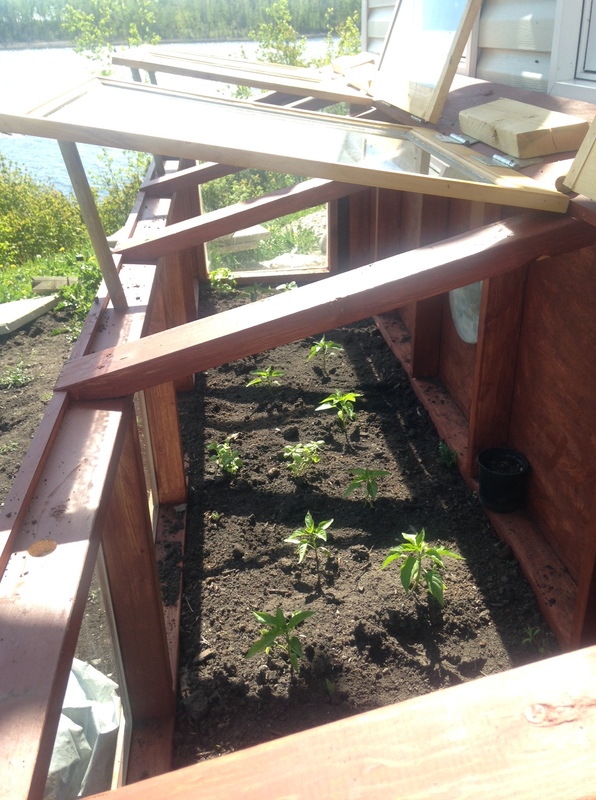 The mini greenhouse that Ken made this spring worked very well and the bedding plants thrived in the warm environment. Now that they are in the garden, I have planted most of the peppers, my two eggplants and the basil directly into the soil in greenhouse. I am hoping the warmer environment will provide a better crop for these heat loving plants. I buried a soaker hose in the soil and it is hooked up to the rain barrel. The soaker hose is just an old garden hose with holes drilled in it. It works really well. And I have now mulched the plants in the greenhouse and they seem to be loving this environment. The hill area south of the house was tarped last year with black plastic to kill the weeds and grass growing there. We have removed the plastic and it did a great job in killing the weeds. Ken rototilled up the section and I planted the watermelon and squash there. I put old tires out and planted inside each tire. I am hoping the tires will provide a bit extra heat for the young watermelon plants and my plan is to mulch the area around the tires to keep the weeds down and conserve water. I had a couple of plants cozies (plastic tubes which are filled with water and surround the plant like a mini greenhouse) which I put around three watermelon. I will remove them once the plants start to vine out a bit more. I also planted a variety of flowers and sunflowers in between the tires, so once those are up I will mulch the area to keep down the weeds. As you can see I am having a lot of fun in the garden this spring. Ken put up two pea fences for me and I planted one early – May 13, and one late (actually today, June 1) I am hoping to get an extended pea picking season. 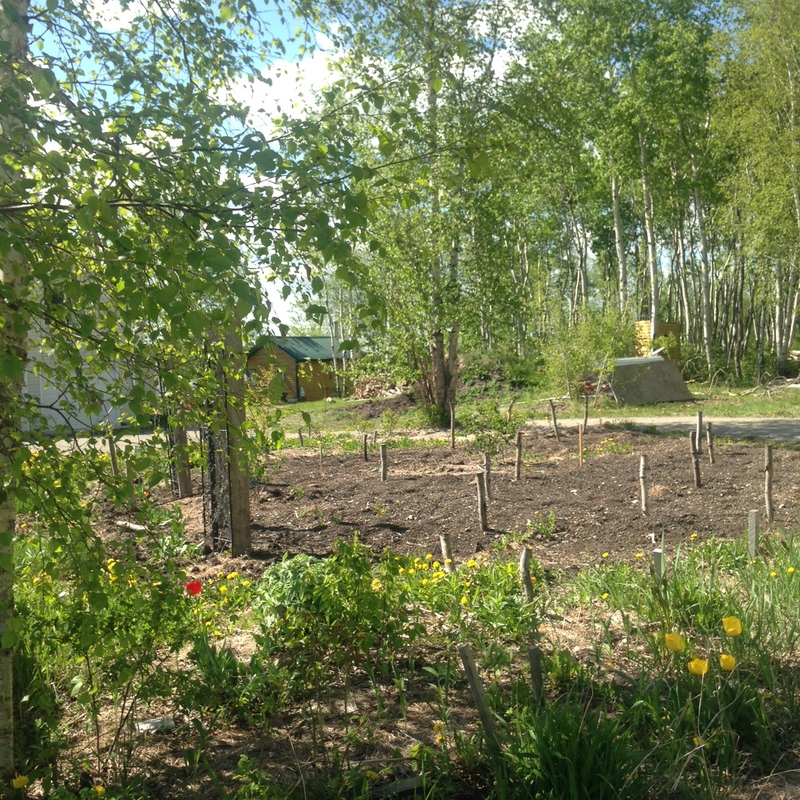 While the weather has been nice – sunny and warm, there has not been much rain. 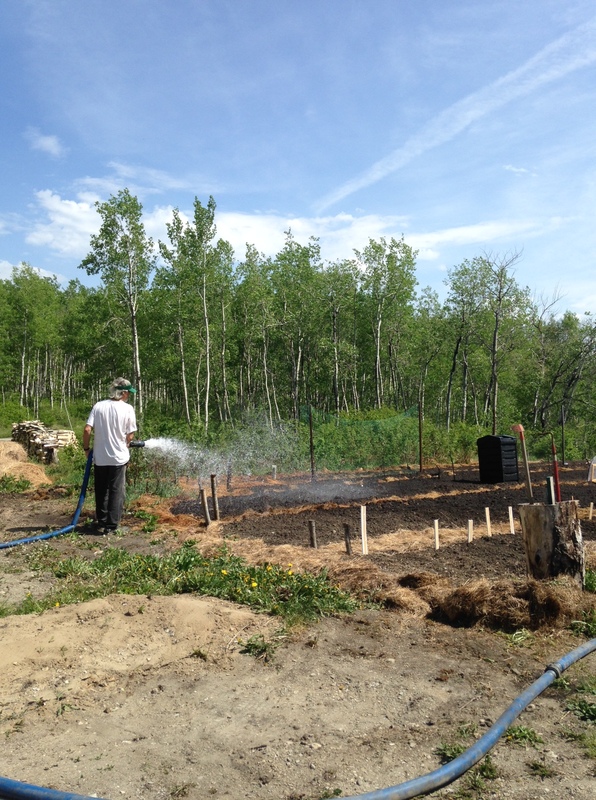 Ken hooked up the watering system and we pumped water from the lake and gave the garden a good soaking today. Hopefully that will get all those beautiful green shoots popping out of the ground. Its been wonderful to have a bit more time to play in the garden this spring. I love trying out new ideas, and hopefully some of them work out. I will post again later when the garden looks more green and less like lots of black earth! This entry was posted in Gardening and tagged brassica barriers, broccoli, cabbage butterfly, Cauliflower, row covers, tomato cages, watermelon. Bookmark the permalink. Thanks Bruce. It was quite a job digging out the paths but very rewarding. Sort of like a gym membership. Lol.